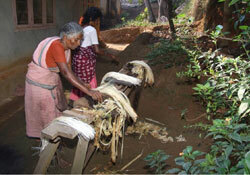 Plait-making for high quality, hand-made banana fibre products. Kanniyakumari, Tamil Nadu. 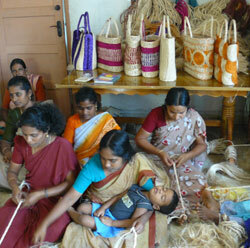 This group is benefiting from skill training in the use of banana fibre twine to make a range of craft samples. The next step is to introduce new designs, match them to particular markets, test market on a small scale, modify the design, and so on. It is important that the buyer is made aware of the amount of time and skill needed to make each item. This group comes from Kaniyakumari, Tamil Nadu, on the southernmost tip of India, where almost 1,000 people were killed by the tsunami. Most of the women in this picture are burdened with crippling debts to local money-lenders, and their priority is to reduce that burden. Transrural is sponsoring the small-scale development and test marketing of attractive containers made from natural fibres, as part of its post-tsunami programme. Plastics offer great benefits for so many uses; however, people are becoming increasingly aware of the problem of disposing of plastic bags and packaging. This awareness is not confined to the western world. Drains in highly populated parts of India, for example, are increasingly getting blocked by plastic bags and bottles, and mountain resorts have been spoiled by plastic litter. In Kaniyakumari district, an excellent raw material is already produced in abundance. After the banana trees are cut down for the fruit, the trunks are sometimes left to rot. However, if this by-product is collected and the fibres extracted, there is no end to the scope for making lovely items, from bags to belts. The process entails much careful handwork, and so the product must be clearly differentiated from “cheap and cheerful” factory alternatives. At the time of writing, we are also assessing the potential of another natural fibre, sisal. This plant was introduced during the colonial era, as a source of raw material to be exported by the East India Company. The idea at that time was to add value in the-then industrial world by making rope and other goods in the factories of the industrial revolution. 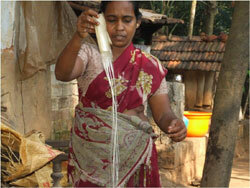 The idea today is to add value in India for the benefit of the poorest in society, making bags, for example. Sisal offers environmental benefits as well. Planted as a living fence, it helps prevent soil erosion caused by the monsoon rains that otherwise wash away the topsoil into the rivers. This work is in its infancy, and is not without its challenges. To be successful, there is need for excellence in design. Equally important is promotion that encourages customers to pay a sufficiently high price to ensure a fair return to the producer based on the amount of work that has gone into the product. 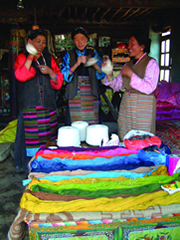 During the period 2010-12, Transrural is sponsoring grass-roots development of community-based enterprises in the hand-made fibre sector, involving tsunami-affected people. This is not easy, but rural development in poor areas is never easy, and success cannot be guaranteed. However, the 200 people, mainly women, who stand to benefit from the Transrural initiative, are some of the very poorest. The people who collect banana trunks currently earn about 25 Indian rupees a day – well under the dollar-a-day baseline minimum which defines, within the UN Millennium Development Goals, the very concept of poverty.